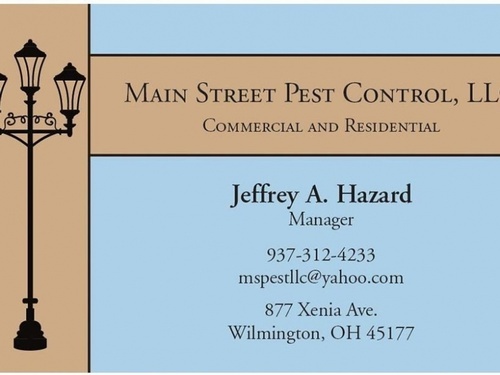 Main Street Pest Control was conceived by a need for a truly local pest control company. Jeff Hazard moved to Wilmington in 2008 and realized there were no companies to choose from that were actually based in Wilmington. Working in management for a large California pest control company for over 23 years, Jeff has experience in general pest control, termite inspection and treatment, rodent control, bird abatement and specializes in bed bug control. His wife, Jomaye Hazard also worked as a pest and termite secretary for the same California pest control company. Moving here to take care of the family home (Jomaye,s home town), Jeff started the steps required to build the business. Licensed and Bonded in pest and termite control per the Ohio Dept. of Agriculture and the State of Ohio. Doing this in his spare time with a full time job, Jeff is now able to devote full time for his customer?s needs. Offering fast response time and personal attention to client?s issues or concerns. Offering all types of pest control for commercial and residential, which includes one time jobs with a 60 day guarantee, monthly, bi-monthly and quarterly maintenance programs. Also bed bug treatments which include an initial service and 2 follow up treatments for a reasonable price.